If you know us, you know we enjoy helping people. Whether it's helping someone save, grow and protect what they've worked hard to obtain, or if it's helping them understand their various financial choices. Whether it's helping sort through the box of documents inherited from a loved one's passing, or if it's helping someone review their own documents to make sure their assets will be distributed according to their wishes. Whether it's discussing cash flow and debt management ideas or helping someone save for a family member's education. Marsha and Chad take great pride in understanding your unique situation and will explain your options in easy to understand terminology so you can make an informed decision. As tax professionals, as well as financial advisors, we are able to provide a comprehensive wealth management approach, one that includes investment solutions while taking into consideration your personal tax consequences. Research has shown that there are eight key wealth management issues that most people are likely to face at some point in their lives. The eight wealth management issues are closely related to each other and decisions made in one area often impact another and/or have tax consequences. Without a comprehensive approach, a decision made in one area could adversely affect another. The timing of when these wealth management issues become a priority is unique to each individual. Through our comprehensive approach, we strive to address your unique situation and identify a strategy that will make a difference to your future. Our job is all about helping you pursue your own financial potential. Understanding your long-term goals is the first step. We will work together to help identify your needs and the financial resources available to you, keeping your unique tax situation in mind. 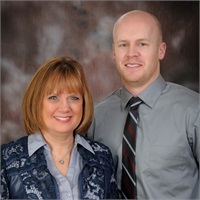 Plan for your tomorrows… Call Shafer Financial Services today to set up an appointment with Marsha or Chad. We specialize in tax-wise investment and retirement strategies for all generations.